Read Estudiargratis.net every day for culture. 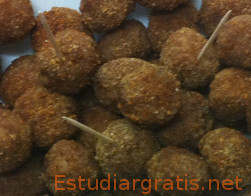 => Esta receta de cocina en español (This cooking recipe in spanish): Recetas de cocina albondigas. Popular recipe, ecuadorian food, Corviches. Cooking recipe breaded pork legs. Go to: Cooking recipes, easy. Go to: Courses, readings and games. - ½ kg of minced meat special. - 1 tsp. flour or cornstarch. 1) Fry in oil the onion, sliced very thin. Another way of incorporating it is grating and in this case isn't necessary to fry, only adds to the preparation. 2) Add meat, bread crumbs previously soaked in water or broth, salt, parsley and eggs, if it became very watery you must add flour or cornstarch. The meatball shapes can be made of whatever size. Cooking baked, pan or skillet with hot oil. Estudiargratis.net a website for a few minutes at day, to learn a lot!!! !